The closest English one could use is 'latent potential.' From the Japanese term aji (味), meaning taste, it refers to played stones' lingering ability to open various avenues of play. Though not all aji is pursued or taken advantage of, it bears on the course of the game. Good aji is when your groups are strong, and have little or no possibility of being compromised. Bad aji is when dead stones or weaknesses in one's own formation carry a latent threat of compromising an existing area should the situation become ripe. Aji is different from a simple defect or weakness in that it can be exploited and/or repaired in multiple ways at multiple stages of the game and the best way or time is not immediately clear; hence the "aftertaste" metaphor. In Japanese, atari (当たり, あたり, or アタリ) is the nominalized form of ataru (当たる, あたる, or アタル) (verb), meaning "to hit the target" or "to receive something fortuitously". The word 'atari' is used in Japanese when a prediction comes true or when someone wins a lottery. In Chinese: dǎchī (打吃); Korean: dansu (단수). Atari is a term used in Go for a situation where a stone or chain of stones has only one liberty, and may be captured on the next move if not given one or more additional liberties. It can be a verb for the act of placing a chain under atari, as well as an adjective to describe the status of a unit, as being "in (the state of) atari". Calling out atari during a game is sometimes done by beginners much like calling out check in chess, but it is considered rude by many more advanced players. Above is a simple atari formation with only one stone (the white triangled stone) in danger of being captured. If black plays a, the white piece is immediately captured and removed from the board. White can escape toward the center by playing at a herself, creating a string with three liberties. Below, another white group is in atari, but playing at b along the side will do no good, since Black can then play c and capture the whole group on the next turn. b) Origin of heaven (天元, tengen): the center of the board, located at (10, 10). c) Five by five (五の五, go no go): a (5, 5) point in a corner. d) Three by three (三々, san san): a (3, 3) point in a corner. e) Small eye (小目, komoku): a (4, 3) or (3, 4) point in a corner. f) High eye (高目, takamoku): a (5, 4) or (4, 5) point in a corner. g) Large high eye (大高目, ōtakamoku): a (6, 4) or (4, 6) point in a corner. h) Outside the eye (目外し, mokuhazushi): a (5, 3) or (3, 5) point in a corner. i) Outside the large eye (大目外し, ōmokuhazushi): a (6, 3) or (3, 6) point in a corner. Dame (Japanese: 駄目 [daˈme]) are unfilled neutral points that will not benefit either side. Typically, the term refers to vacant points that lie between two opposing forces, and will eventually be filled without altering the score. Basically, dame points are of no interest, though they must be filled before counting the score under area (Chinese style) scoring. The Japanese rules define a dame as a vacant point that is not surrounded by live stones of only one color, so the term can also refer to an empty point that is tactically useful as a liberty for a unit. "Divine move" redirects here. For the film, see The Divine Move. A divine move is a truly inspired and original move: one that is non-obvious and which balances strategy and tactics to turn a losing game into a winning game. A divine move is singular—they are of such rarity that a full-time Go player might play a single such move in a lifetime. The term comes from the Japanese 神の一手 Kami no Itte, meaning "move of God" or "Godly move". The Divine Move is used in Go teaching as a motivation to look again at positions in games and consider not just the obvious moves but the less obvious and more innovative as well, in particular tesuji. An example of such a divine move might be the so-called ear-reddening move played by Hon'inbō Shūsaku in 1846. Another good example is Lee Sedol vs AlphaGo on 13 March 2016 where Lee Sedol made white 78, a "wedge" play in the middle of the board, and it immediately turned the game around and defeated AlphaGo. Eyes are internal, fully surrounded liberties of a group of stones. An eye cannot be filled by the opponent until all of the group's other liberties have been filled. The presence or absence of eyes in a group determine life or death of that group: A group with one or no eyes will die unless its owner can develop them; conversely, a group with two or more eyes will live since an opponent can never reduce the group down to a single liberty. Eyes are counted as occupied territory of the group that fully surrounds the eye. When a group shares (is adjacent to) one or more eyes with the opposing player's groups, those eyes do not count as territory for either player. Sometimes those eyes are reduced to dame as other areas of the board change to give one or both groups additional eyes, allowing one or both players to fill the shared eyes. But sometimes those shared eyes do not resolve (see seki below). Applying these concepts to a whole sequence is basic to higher strategy. If Black starts a sequence that properly ends in an even number of plays, Black retains sente in doing this. If Black starts a sequence that properly ends after an odd number of plays, Black loses sente and takes gote. Accepting gote should only be in return for some profitable exchange. Correct play in the yose (endgame) can consist of playing available sente sequences, and then taking the largest gote sequence on the board, though that description is a simplification. A reverse sente play is a special type of gote play, preventing the opponent from making some sente move. The relative value of reverse sente plays depends on the overall position, but one can count it as twice the value of what it would be if purely gote. A player has sente if he does not currently need to respond to moves made by his opponent. This can be achieved by tenuki (ignoring the opponent), as a kind of gambit. A player can break out of gote, and gain sente by choosing to accept some future loss on the local level, in order to take the initiative to play elsewhere. In the case that neither player directly responds to the other's moves, the game can become difficult to analyze. Though each player has gote on entering the turn, the move itself is sente. Such games often end in large exchanges, or one player will be shown to have a weaker position and eventually have to answer to avoid heavy damage. A tied score, that is, the players have an equal number of points at the conclusion of the game. With a half integer komi this situation is impossible, but it could happen if the players followed the handicap rules with no komi or integer komi. Jōseki (定石) are established sequences of play which (locally speaking) are considered to give an optimal result to both players. There are thousands of such lines that have been researched and documented. A keima (ケイマ, Chinese 飞 which is fly) is a stone placement which makes an 'L' shape. Often referred to in English as a "knight's move", as it mimics the movement of the knight piece in chess. In the context of Go, kiai (気合い) often translates as "fighting spirit", i.e. aggressiveness or initiative, but not unthinking greed. Kiai means keeping sente, that is not letting the opponent have his or her way. A sensei might say, "You play too passively — put some kiai in your moves!” A passive player may follow an opponent around the board responding to each move in turn. Kiai moves are the opposite of passive or submissive and a player showing kiai will dictate the flow of play. Kiai moves can catch an opponent off-balance and turn the game around. Examples of kiai moves include snatching sente away from the opponent; defending with a move that also counter-attacks; or answering a kikashi (forcing move) in an unexpected way. Kiai is also a term used in Japanese martial arts, usually as a name for a loud yell accompanying an attack. Obviously this is outwardly more restrained in the context of a board game, but it is intended to be in the same spirit. Literally meaning 'an enlivenment', Kikashi (利かし) is a forcing move, usually one made outside the primary flow of play. Unlike sente, though, a move is kikashi when it yields a high efficiency in play by forcing the opponent to abandon a course of action. A kikashi stone will usually be sacrificed while conferring an advantage; for example, the kikashi stone could act as a ladder breaker or destroy the opponent's potential eyeshape, while the answering move has no value at all. Ko ( Chinese 打劫, Japanese コウ not quite the same*) can refer to the Ko rule or strategic use of the rule in a fight. The Ko rule states that a stone cannot be laid such that it makes the board look exactly the same as it did at the end of the player's last move. Commonly, this means that if a lone stone is captured, the next player cannot respond by laying a stone in the same location as the captured stone if so doing will merely cause opponent's last played stone to be captured. This would make the board look as it did two plays ago, and could be repeated indefinitely, which is why such play is forbidden. A player may take advantage of the Ko rule by playing a stone with the knowledge that the opponent will not be permitted to replace the captured stone in the immediate responding move. If the same play is still available in a subsequent turn, the play is not forbidden and the Ko advantage is reversed. This kind of back and forth is allowed because the game is still developing elsewhere on the board in the interim. A Liberty (Chinese qì 气, Japanese dame 駄目 not quite the same) is a vacant point that is immediately adjacent to a stone in a cardinal (orthogonal) direction, or connected through a continuous string of same-colored stones to such a point. A stone, chain, or group must have at least one liberty to survive. A group that has two or more separate internal liberties (eyes) is impossible to capture. This occurs often. Miai can be seen in the fuseki stage on a large scale, or in a simple life and death problem, such as a straight four-space eye. This shape is alive because of its two central points a and b: if Black plays a, White can answer with b and vice versa. Moyo moyō (模様) is a framework for potential territory which usually consists of unconnected stones with some distance between them. The early game usually consists of competing for moyo by attempting to expand one's own and/or invade or reduce one's opponent's. This term is often translated as "framework", "potential" or "wall". Nakade 中手 is a Japanese Go term that literally means "inside move" or "move inside". It refers to a play inside an opponent's large eye that prevents the opponent from making two eyes there. It can also refer to stones inside an eye that prevent it from becoming two eyes. The Double Turn (二段バネ, Ni-dan bane), or two-step hane is a sequence of two moves in succession that turn around an adjacent opponent group. It can be an aggressive and appropriate way to play, although it exposes the stones to cutting. A move normally played in Sente where a stone is placed directly next to an empty point that would connect two groups. The move is provocative without immediately endangering the placed stone and if the opponent ignores it they may gain sente. However Peeps are normally played as forcing moves and are not normally ignored. A move that surrounds an opponent's stone from both sides. The purpose of the attack is to remove the opponent's ability to form a base or occupy a territory on the side. Sabaki (捌き) is the development of a flexible, efficient position that is difficult for the opponent to attack, often by means of contact plays and sacrifice. Seki (セキ) is a Japanese term for an impasse that cannot be resolved into simple life and death. It is sometimes translated as "mutual life." For example, a capturing race may end in a position in which neither player can capture the other. There are numerous types of seki position that can arise, characterized as cases in which neither player adds a play to groups that do not have two eyes. The area remains untouched; at the end all groups involved are deemed alive, but no points are scored for territory. In the seki figure, if either White or Black play on the points marked a, the other will effect capture immediately and will be able (if playing properly) to form two eyes. A stone placed directly next to an opponent's stone, diagonally so it isn't quite attached. Generally used to reduce their territory potential without being easily captured. Thickness is a literal translation of the Japanese word atsumi (厚み) and connotes the position of power and impregnability conferred by the thickness of medieval castles' stone walls. A group is thick when it has developed beyond the level of stability in its local area without accruing significant weaknesses, and consequently projects power at a distance, especially over vacant or unsettled areas of the board. Such positions have a profound influence on the flow of the game. In the diagram, though white has about 10 points of territory in the corner while black has little or none, black can expect the power projected outward by her thick position to more than make up for this. Note that her result would not be as good if white had a settled position in the direction black's influence is facing. 様子 (yōsu) means situation or the state of things, and 見る (miru) is "to see", thus "yōsu o miru", to "see how things stand". In Japanese this expression is usually used to say that it's better to wait and see before taking an action (e.g. "shibaraku yōsu o miru beki da", it's better to wait and see for a little while). It is not a single word or a set phrase except in Western Go literature, and "probe" is the preferred word, being self-explanatory and actually used by the speakers of its originating language. ^ Sensei's Library. "Haengma". Retrieved 2008-05-08. ^ Sensei's Library. "Haengma Discussion". Retrieved 2008-05-08. ^ Sensei's Library. "Calling Out Atari". Retrieved 2008-01-18. ^ "In Two Moves, AlphaGo and Lee Sedol Redefined the Future". wired.com. ^ "Hayago". Sensei's Library. Retrieved 2015-04-27. ^ Yi-Lun Yang with Phil Straus. "Whole Board Thinking in Joseki, Volume 1:3-4 point, low kakari". ^ "Nerai at Sensei's Library". senseis.xmp.net. Retrieved 2015-12-09. ^ Ishigure, Ikuro (1995). 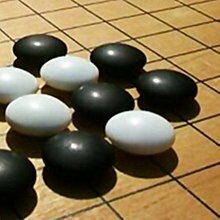 In the Beginning: the Opening in the Game of Go. Elementary Go Series. 1. Tokyo, Japan: Kiseido Publishing Company. p. 32. ISBN 4 906574 10 6. ^ "Yose at Sensei's Library". senseis.xmp.net.